At 4:00 pm today, the New Brunswick government was officially ended, with the election of a new government set for September 18th. The party websites discussed below have been designed and are operated by the three political parties that are fighting tooth and nail to become the next government of New Brunswick. One of them will form the next government and thus will, in a few weeks, be in charge of the design and operation of all New Brunswick government websites. Their campaign sites can be viewed as a part of their resume as they compete for voter approval. 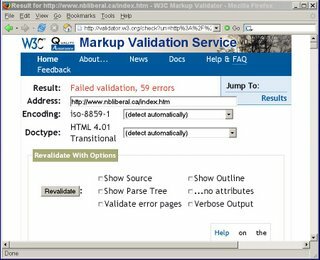 Failed validation report: New Brunswick Progressive Conservative Party 2006 election website home page. For a full-size view, click on the image. Failed validation report: New Brunswick Liberal Party 2006 election website home page. For a full-size view, click on the image. Failed validation report: New Brunswick New Democratic Party 2006 election website home page. For a full-size view, click on the image. I love the concept of your blog. But do you seriously think politicians have any say in the design or content of the government's web site? More to the point, the people who do the parties sites (firms or volonteers, or volonteering firms), will have nothing to do with the government's site. Actually, politicians have considerable say in the design or content of a government's website. At least, they could have if they chose to exercise their power. The usual practice (universal as far as I know) is for each department's website to be completely controlled by that department, which means that the Minister in charge of that department has the final say over all website design and content. If any Minister (an elected politician) tells his/her department employees to make the website comply with this or that guideline or model, it would be done. Yes, the volunteers who do the party election sites will have nothing to do with the government's site. But the party site's content is under the overall supervision of the party officials, and the party must be held responsible for shortcomings in its website. If a party website is riddled with spelling mistakes, or factual errors, or racist slurs, do we simply overlook this? Of course not. A failure of a party website to comply with accepted standards must be seen as part of the presentation the party is making to the voters, which the voters should take into account when making their voting decision. If a party website displays blissful ignorance of modern accessibility standards, it is proper for voters to take this as an indication that this party, when in government, will be insensitive in this area. In September 2006, New Brunswick voters elected the provincial Liberal Party to a majority government, with its leader,Shawn Graham, becoming the new provincial Premier. The Liberals defeated the incumbent Progressive Conservative Party, led by Bernard Lord, who had governed the province since 1999. This article provides background information on elections in New Brunswick, as well as an overview of the key participants, platforms, issues, and results of the 2006 election. The major task of a Web Development Company is to how to fulfill the clients requirements.I noted several things about how to choose the best government website design and Web Development Company.Then i must look up for how the high quality development services is very expensive in today's world.